As the new year is finally here, rather than focus on one area of your life for improvement, why not do it holistically? 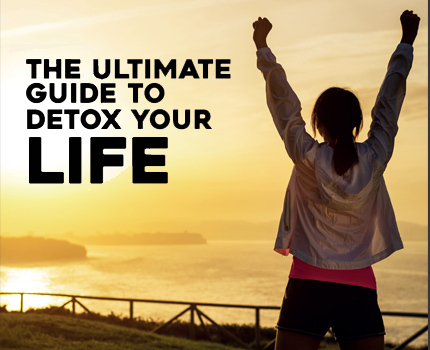 HEALTH presents the ultimate guide to a new you for 2017.
be advisable to detox maybe two or three times per year and for a longer period of time. According to Dr. Alonso, herbs and supplements that improve liver and kidney function are an important part of detox, as well as colon hydrotherapy, manual lymphatic drainage, cupping, acupuncture, and certain types of massage, all depending on individual assessments by an expert. overwhelmed and out of control. with a ‘tech detox’, she advises. “Really feel what it is like to step out of so much daily use and then be able to design and establish a healthy ‘tech diet’ going forward which will enable you to retain your equilibrium,” says Jacques. 1. Decide on regular ‘no device times’ For example, after 8 at night or on Saturday mornings, and so on. It’s important to get away from its effects on your brain. For example, dopamine (a neurochemical) spikes when you swipe your smartphone. This keeps you awake and produces addictive feelings. Prioritize real person contact over your relationships with friends online. Having a policy of no devices at the dinner table enables the family to connect and relate without distraction. It also teaches kids that people and relationships are most important – especially the ones right in front of you. Practice mindfulness This gets you powerfully in touch with your body, your feelings, your wisdom, the present moment and enables you to stand back and observe your habits of mind. Daily mindfulness practice puts you in a great position to naturally relate to life in a healthy way and make good choices about technology. Move your body and participate in groups Step out of your comfort zone and into your growth zone more often. The more you are engaged in a meaningful, purposeful life, the less you will crave distraction. It will become obvious to you how much tech to engage with and when and which aspects of it are toxic for you. Practice Self-Awareness Pay attention to your feelings – much like a thought-diary, notice when you’re out of sync and try to understand the source of that feeling and whether it is valid, then make changes accordingly. Also, notice when you’re feeling fulfilled, happy and at peace and invite those experiences into your life more frequently. Create Goals that Resonate with You – Articulate your ultimate purpose and define your values and what they entail to you then think of steps you can take to make them part of your life. This way you will be leading from what is important to you. Make Room for your Goals – Goals don’t exist in isolation –everything we do is interconnected. Think about the changes you need to make in order to fulfill your goals. For example, you may need to reduce your social outings to make time for exercise. Create Clearly Defined and Measurable Goals – Rather than ‘I am going to get in shape’, specify what that means to you by making them measurable and time-bound. This will not only motivate you as you reflect on the progress you’ve made, but it will also help you identify struggles and plateau points which you can then address. Don’t Beat Yourself up – Drop the all-or-nothing approach because progress is not a linear process. When you face a relapse – pay attention to what caused it, forgive yourself, learn from it, offset the relapse by doing something beneficial and get back on track. Share your Goals – Sharing your goals will make others hold you accountable to them and will also encourage support and attract like-minded companions. The more we channel our wishes, the more we invite the environments that foster them. Make your Goals Visible – Whether you print your list and place it on your fridge-door or have it broken down into reminders on your phone, make sure you can see them and be reminded of them as this will help you stay on track. Celebrate your Achievements – You deserve a pat on the back for every little step you’ve taken to reach your goal. Celebrate success between milestones and appreciate the differences you’re seeing – no matter how slow or small they are because sustainable long-term results don’t happen overnight. Declutter: If you haven’t done it already, declutter. It sounds obvious, but it is far easier to keep your things organized and clean if you have less stuff to keep organized and clean. Take it one step at a time, room by room or even drawer by drawer, and soon you will start to feel lighter and more in control. A place for everything: Return your belongings to their proper home as soon as you have finished using them. This means less time searching for items, and less time spent tidying up your home. Keep a list: Get into the habit of writing a to-do list. Each evening, review your list and pick the three things that you must do tomorrow. Write this on a post-it or a new page in your notebook, and use this to focus your energies. Plan ahead: Prepare for the next day the night before. Choose your outfit, pack your bag, make your lunch, check your diary and review your tasks for tomorrow.